Please join us to support our local Seminarians through the St. John Knights of Columbus Council 11281 Vocations Fund and to Honor Monsignor Coll and his 60th Anniversary of Ordination. We will have an evening of fun, food, dancing and entertainment including an Open Bar. Joe Marino’s “Dancin’ Through the Decades” Duo will perform. Dinner will be provided by Frisco’s. Reserved Seating Only – Special Tables with Priests, Seminarians can be purchased. Entertainment and Dinner begin after 6:30 p.m.
No sales or refunds after May 23rd or at the door. Msgr. 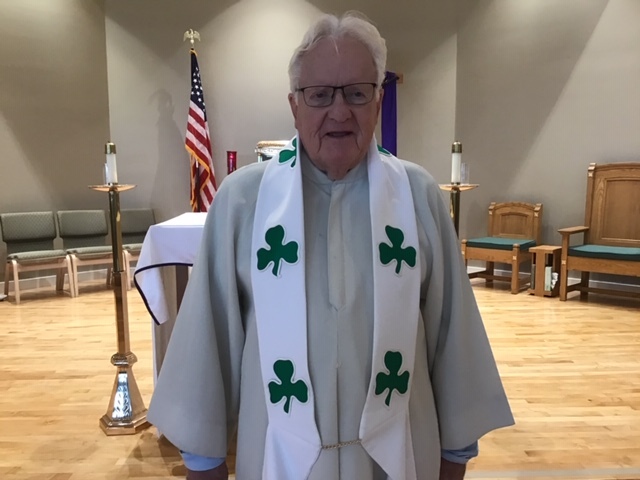 Coll is a former executive of Catholic Relief Services in New York and Rome, had been appointed pastor of Assumption Blessed Virgin Mary Church, Upper Saucon Township. While heading that parish, Coll continued as executive director of the Interfaith Hunger Appeal, New York. The Hunger Appeal was founded in 1978 by the American Joint Jewish Distribution Committee, Church World Service and Catholic Relief Services to focus the attention of Americans on world hunger. Coll’s involvement in ecumenical activity goes back to the 1970s, when the priest belonged to an interfaith group in Lehigh County as pastor of St. Thomas More. Concerned about the millions of people who were starving in Third World countries, Coll and other clergymen started Operation Rice Bowl in Allentown. The charity began as an ecumenical Lenten sacrifice program in the diocese under retired Bishop Joseph McShea. Families participated by skipping lunch on designated days and donating the meal money to the fund. People in the Allentown Diocese alone have contributed $1.5 million over the past 12 years. The cause was adopted in many other cities after Coll made several promotional trips across the nation. Nationally, it has raised tens of millions of dollars. Regarded as a talented administrator and organizer, Coll left the Allentown Diocese in 1980 to become assistant executive director of Catholic Relief Services. He served until 1983, when he was sent to Rome as the agency’s European director. Coll’s duties took him to many countries in Africa and Asia were famine had struck. In October 1984, Mike Wallace and a CBS “60 Minutes” television crew interviewed Coll at a refugee camp in Ethiopia, where he obtained 300,000 tons of food for drought victims. Coll was European director until Sept. 14, 1985, when he joined the Hunger Appeal. Born in Upper Darby, Delaware County, Coll attended schools in the Philadelphia area and spent two years at St. Joseph’s College in Philadelphia before entering St. Charles Borromeo Seminary in Philadelphia. He was ordained a priest in 1959 and was named a monsignor by Pope Paul VI in 1974. He was an assistant pastor of Sacred Heart Church, West Reading, 1959-64 and of the Cathedral of St. Catharine of Siena, Allentown, 1964-66. He also served as administrator of St. Ignatius Loyola Church, Sinking Spring, in 1966, and as pastor of St. Thomas More.